Welcome to our first post of a new series dedicated to the marvellous world of Italian Street Food! First of all, let’s clarify what Street Food is all about and where the trend started. Street Food is basically an informal type of meal you can buy from a street vendor or at a market. Usually you can buy this food from a van that is equipped with a kitchen especially designed for that type of food preparation whether that’s deep frying or searing on hot slabs! Street Food was very popular in ancient Greece as well as ancient Rome where it consisted of fried fish and vegetable soups, usually meant for the poor people. It was also very popular in colonial America as well as the 19th century, when French-fries started to become popular. Nowadays, all around the world, Street Food has become the ultimate fast and easy to eat meal and it represents the cultural side of a region, as well as its most authentic gastronomic tradition. In Italy Street Food has always represented a chance to try some real, traditional, bite-size local delicacies. Every region has its very own specialities and together we will explore some of the best foods prepared and sold all over the sunny boot! Let’s start with Sicily, said to have some of the best street food in the world! 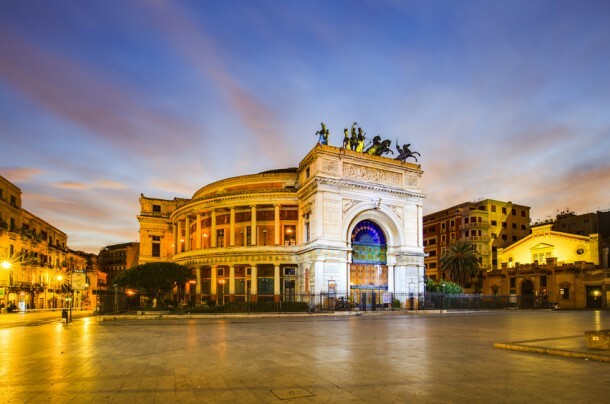 Sicily is one of Italy’s regions that have a truly great variety of Street Food possibilities and wonderful markets such as the Vucciria and Ballarò. Their culinary tradition is heavily based on fried rice and chickpea cakes as well as some unbelievable ricotta cheese sweets. But these are not the only Street Foods you can find in this lovely location. This is the basic aliment every true Sicilian loves! Arancine (which means small oranges, form their size and form that is usually round) are basically a ball of fried saffron rice stuffed with minced meat and peas. You can easily make out the Middle Eastern influence in this dish, which is represented by the use of saffron. Many Southern-Italian dishes plant their roots in the Mediterranean cuisine and the merging of these cultures in food has always created unbelievable experiences! The best places for arancini in Palermo are “Oscar” on via Mariano Migliaccio, n.39 and “Matranga” on via Cesareo, n. 38. This is practically a sandwich made with fresh panini and chickpea flour fritter. Sicilians usually eat this during their lunch break from work and it is a heavenly experience. The bold and brave ones will add a crocchè to their sandwich, which is a fried potato croquette. Talk about a calorie feast! Try them at “Chiluzzo” on Piazza della Kalsa n.10 or at Friggitoria da Davide on via Villa Sofia and you want be disappointed! The name of this delicious, thick, soft pizza comes from the Greek spongos meaning sponge and, as a matter of fact, it does have quite a spongy texture! This pizza bread base is usually topped with a sauce made with tomatoes, onions, anchovies and oregano. “Spinnato” on P.zza Castelnuovo, n.16/17 is definitively the place to go to if you like to try them. The name rascatura comes from the Italian word raschiare meaning scraping, and this is is exactly what you want to do when preparing these fried goodies! Rascatura is made from the leftovers of pane e panelle, crocchè and arancine dough and it is different each time it is prepared. It is generally shaped as a potato croquette but has a darker shade and tastes like potatoes, chickpea flour and parsley. This is a Street Food for those with a fairly strong stomach, vegetarians and vegans should stop reading now! 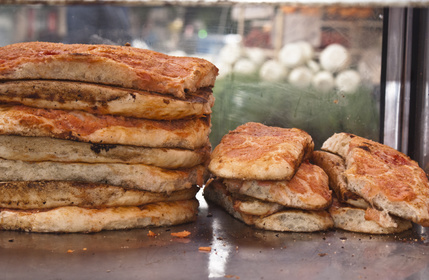 Pani ca Meusa is a sesame sprinkled sandwich stuffed with calf spleen and lungs. Usually these pieces of meat are boiled first and then pan-fried with lard. You can top-off the sandwich with a pinch of salted ricotta cheese to make it even tastier! The best places in town where you can try Pane ca Meusa are “Antica Focacceria San Francesco” on Via Alessandro Paternostro, n.58 a real Palermo institution and “Franco U’ Vastiddaru” on Corso Vittorio Emanuele n.102. These are typical Sicilian pastries made with ricotta cheese, candied fruit and chocolate pieces. They are not strictly confined to the Street Food category since you can also find them in patisseries and restaurants, but they are still perfect to eat on the go! 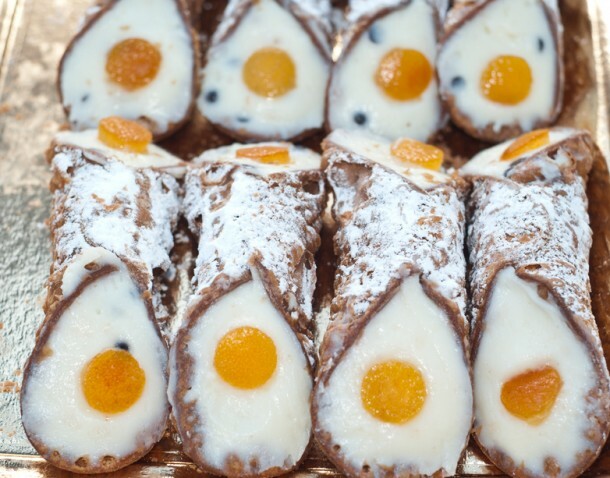 Cannoli are a Sicilian speciality and the best ones just melt in your mouth! If you are planning a gastronomic tour of Sicily don’t forget to cross out these delicious treats from your must-eat bucket list! You won’t be able to resist the delicious cannoli to be found at “Fabbrica di Cannoli F.lli Rosciglione” in via Barbieri, 5 or “Cappello” in via Colonna Rotta, 68 that is also a very good cake shop. These are most certainly not the only Street Foods you can find in Sicily but they are definitely the most popular. Don’t forget to always ask the locals for their advice on what to eat and where when on your Sicilian Street Food Tour! Look out for our next post coming up soon when we’ll be eating our way around Naples!